This section gathers posts that showcase highlights from the collection, as well as links made between documents in the collection through serendipitous discovery. This section highlights exchanges and conversations between the Artexte research community and the contemporary art community. It includes interviews, responses to articles or blog posts, or documentation of institutional partnerships. This section features the work and observations of the individuals who frequent Artexte, including researchers, authors, students and artists. This section is dedicated to employees, interns and volunteers who discuss their professional experience. 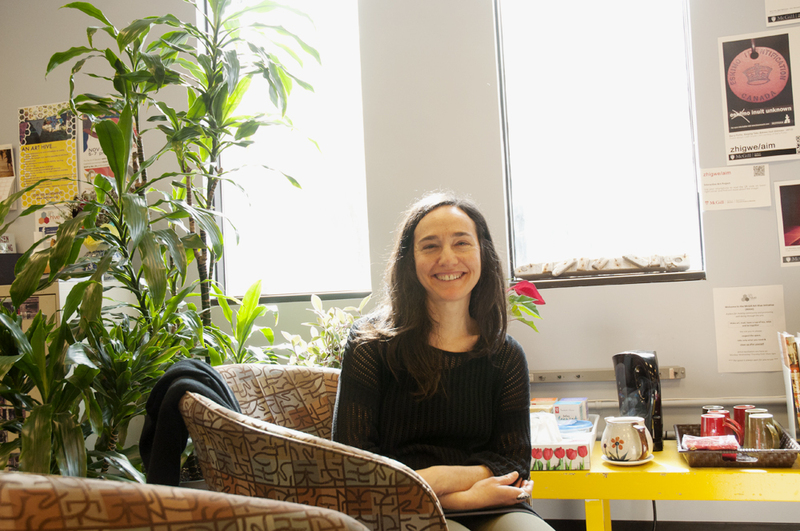 Following a zine-making workshop the McGill University Art Hive Jessica Hébert, Artexte Librarian, sat down with artist Victoria Stanton to chat about her practice (March 14th 2018). Victoria Stanton is an interdisciplinary performance artist and researcher-curator-educator. She has curated performance art programs for artist-run centres in both Montreal and Toronto, has contributed critical writings about interdisciplinary performance practices – in particular the performative as it is revealed in material and time-based works – to a variety of art publications, and is a founding member of the performance art/research collective, TouVA (with Sylvie Tourangeau and Anne Bérubé). 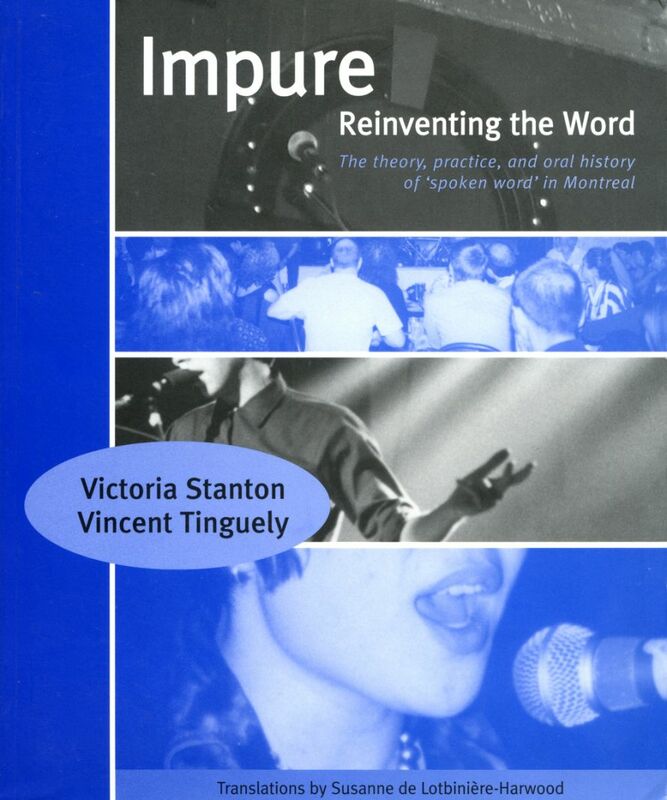 Her first book Impure, Reinventing the Word: The Theory, Practice and Oral History of Spoken Word in Montreal (conundrum press, 2001), co-authored with Vincent Tinguely, chronicled a vibrant artistic movement via interviews with over 75 artists. Her second book, The 7th Sense: Practicing Dialogues / Practicing Workshops / Practicing the Daily Performative / Practicing Performance Art (SAGAMIE édition d’art, 2017), co-authored by TouVA, and initially researched during their eight-month residence at Artexte (2008-2009), draws upon a profound exploration of “the performative” in performance art. Stanton, Victoria and Tinguely, Vincent. Impure : Reinventing the Word : The Theory, Practice, and Oral History of 'Spoken Word' in Montreal. Montréal, Qc: Conundrum Press, 2001. Stanton, Victoria and Tinguely, Vincent, "Industrial Food", Perfect Waste of Time. Montréal, Qc. No 24, November 1997. JH Hi Victoria, can you talk about how you first started getting into zine making? VS I first started making artists’ books before I started making zines. I became interested in artists’ books when I was doing my undergrad because I didn’t really have a sense of my practice as a visual artist. I didn’t really feel like I knew how to draw, I didn’t really feel like I was quite interested in exploring those visual media in ways that were being shown, and something that was more small and contained – like the book, was a less intimidating format for me to explore. It initially began with doing collage, and then those collages made their way into postcards. I had those postcard projects and then the postcard projects ended up becoming book projects. I wanted to explore these ideas through combining collage, drawing and writing, though it was mostly collage and text. That was the beginning of this research into bookmaking and multiples, and from there the interest in zines kind of emerged because I realized that I wanted to do things that were maybe less labor intensive. The books ended up inevitably taking hours and hours and hours. I’d make several copies, and I’d be hand sewing each one or hole punching each one, so the zine that I could photocopy and fold was definitely an easier thing to do. 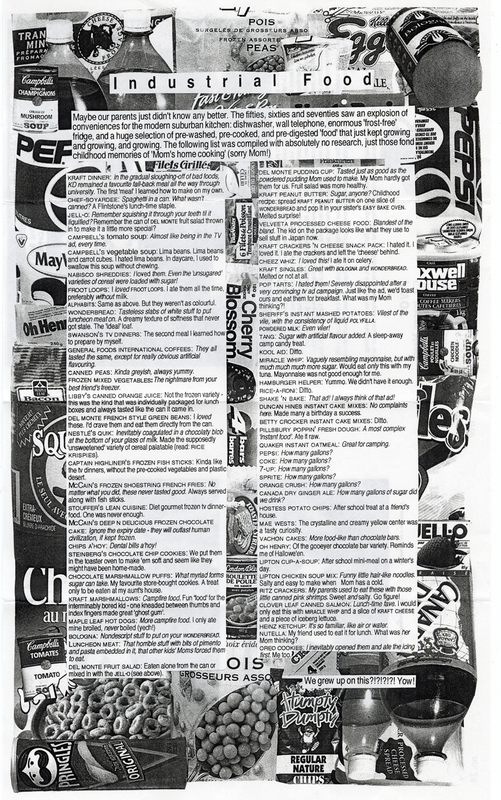 The big zine project was when my ex-partner Vince Tinguely and I – who were both super involved in the spoken word community – at a certain point, we were feeling like there was a bit of a block of places to show work, or people with whom to work, and we were both feeling a little stuck. We wanted to explore another area where we could be talking about the same things but in a different format, and that’s when Perfect Waste of Time came to be, the zine project. 1Victoria Stanton, Vincent Tinguely (1997). Perfect Waste of Time. JH Yes, because I was curious about that link between the spoken work practice and the zine practice. JH And what was the feedback? VS Well for one thing, we were already into Factsheet Five, looking up stuff and ordering zines. We sent copies to Factsheet Five like, “could you review this?” But then, we learned about Broken Pencil in Toronto so we sent copies them and so they started getting reviewed. But as soon as we started showing these to a different public we had to say who we were. So, we went from being anonymous to being “this publication” so that ended up opening up the dialogue even more. We did get really good feedback, but we also kind of didn’t care if it was good or not. Feedback is feedback, people don’t have to like it. I remember one issue where the person who reviewed it was like “I’m confused, I don’t really know what’s going on here,” and another person was quite complimentary about what it was we were saying and how we were saying it and that went from us being asked to write about self-publishing. We ended up on the other side of the coin kind of quickly, from making, to being asked about the phenomenon of making. JH I know that Perfect Waste of Time has a lot of political content, local politics. Can you talk a little bit about the process of creating each one? VS Vince and I, at the time were living together so we were talking together and listening to the same news. We were always in these conversations and every so often we would hear something or see something, one then of us would say, “ah that’s going to be a perfect topic to talk about for the next issue.” If there was an election that happened with unfavorable results, or a particular ad that was running a lot, we’d be like “what is this ridiculous ad? We need to say something about that.” I think one of my favorite issues is the one talking about the food we both grew up on. Both of us as it happens, did not come from hippie parents and we both grew up on heavily processed food. So, we did the processed food issue – food from our childhood issue. 2Victoria Stanton, Vincent Tinguely (November 1997). 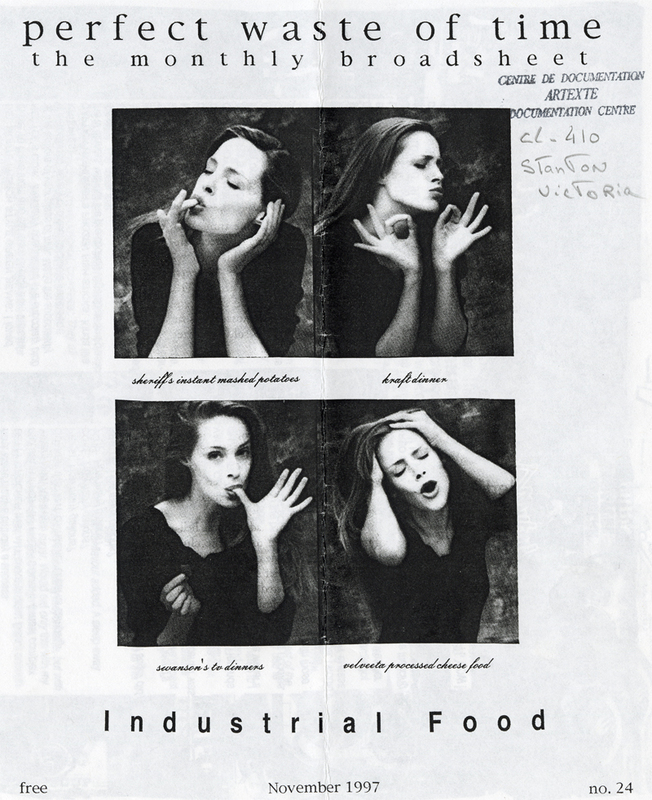 "Industrial Food". Perfect Waste of Time. That would have been pretty quick to do, but it might have been something that we would have just been talking about casually and then said “ah we need to do a zine about that – about the horrible food we grew up on!” So, the issues of the day were combined with things that were really absurd and ridiculous. JH I am curious to about the parallels between the communities of people involved in the zine scene, and those involved in the spoken word scene? Are they particularly connected? VS I would say yes. I am not sure to the degree now, because I am not as involved in that specific loop as I once was. So, I can’t speak to what’s current now. To me there is a natural relationship there because one thing they both have in common is not waiting for someone else – to publish you, to show your work, to announce that you’re doing something. It’s really of that DIY phenomenon. With spoken word – specifically those who were into writing and who wanted to have another venue to be actually saying their work. Instead of having it on paper, this was another way to share those stories, those narratives, those poems, or that prose. Often people who would bring work to the stage would then accompany that with a publication. The two would happen, someone would create a performance and a book for the performance, or have a book and then perform excerpts from the book. Catherine Kidd is a really excellent example of that because she had self-published work, and then work that got published, but of all those texts are texts that either had been performed, or will be performed anyway, so often the books would come out with recordings. There is a kind of symbiotic relationship between the spoken word and self-publishing, because spoken word is a sort of form of self-publishing, except in a live performance. JH Can you talk about the relationship that you have now between self-publishing and performance art and how that is related to your performance practice? VS I don’t know if it’s as present as it once was, this notion of self-publishing, because I think the writing ended up taking precedence and ended up becoming book projects that were getting published, which is a different kettle of fish. I still see a strong relationship between them, because earlier on, after every performance, for a series of performances, I’d always make a stamp. I’d either put the stamp on something or put the stamp on the person, as a mark left from the performance, or a line left from the piece, or the title of the work. So, those were traces and I still have those stamps. There’d be some sort of giveaway – some sort of gift. Which I stopped doing in that way, but that’s an interesting question, because it’s not something that is really present for me now, but I still see a really strong relationship between those two things. Now, the extension of that is this embodied research, that wants to find another venue, so writing has come from that, but has landed in different places. There might be texts that are on blogs online for example, or occasionally pieces for magazines, where I’m writing about the performative process or writing about someone else’s practice, because it’s become a subject that’s become really interesting for me – the performative in art making. 3Victoria Stanton, Vincent Tinguely (2001). Impure : Reinventing the Word : The Theory, Practice, and Oral History of 'Spoken Word' in Montreal.. Now with the TouVA collective, we just put out our book, which we worked on for 10 years, but with that book – there were several texts that got published before that book actually came out. 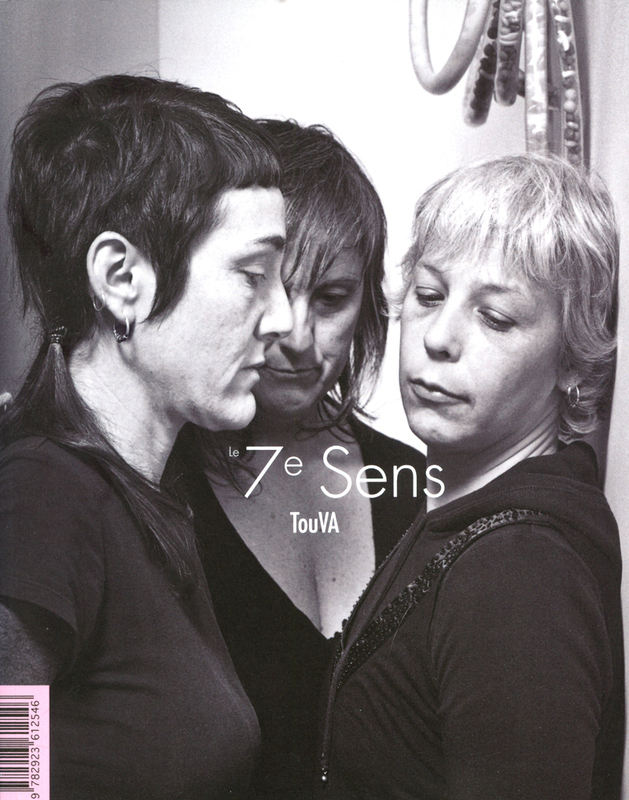 4Sylvie Tourangeau, Victoria Stanton, Anne Bérubé, TouVA (collectif) (2017). The 7th Sense: TouVA . Alma, Qc: SAGAMIE édition d'art; Calgary, Alta: M:ST Performative Art Festival.. I still see a strong relationship between performance and writing, but it might not be self-publishing. It could be self-publishing, but it could be publishing that happens in other venues also. I don’t discount the possibility to self-publish, but it’s one of those things, where a passion was really important to creating, and it ended up being a springboard to other things, and those other things have maybe taken over in a way that feels really all-encompassing. But it doesn’t mean that I won’t necessarily come back to that which was the springboard. JH Do you foresee ever coming back to doing that, making zines or doing those recordings? VS Yeah, it’s always there as a possibility and there is always this desire to want to do stuff and I feel like “Oh, I don’t make the time for that,” because all these other things have kind of taken over. But those other things that have taken over might have a finite lifespan, it’s hard to say. I never thought that I’d become interested in making objects again, and suddenly objects seem to have come back into my making, except the difference now is that I am making things and they are living somewhere else – they are being gifted. So, I am not interested in making and accumulating, but making and finding a life somewhere for those things is more interesting to me. If I am going to make something, I want to then find a venue for it. I could see it coming back. It’s hard to say in what form, but putting things into publication form is still really interesting to me. JH Often I find with self-publishing and artist books, it’s like a gift economy, you give things and people give things to you. VS Yes, that’s true, it’s a really nice circulation exchange, and I really like the communities that spring up around that too that’s also really exciting to me. Impure : Reinventing the Word : The Theory, Practice, and Oral History of 'Spoken Word' in Montreal. Alma, Qc: SAGAMIE édition d'art; Calgary, Alta: M:ST Performative Art Festival.